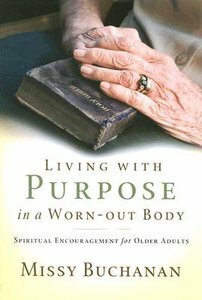 Birthed out of real-life experience, Living with Purpose in a Worn-out Body is a big dose of authentic spiritual encouragement for frail elderly who struggle to find purpose at the end of their lives. These devotionals addressed to God raise in prayer the many concerns of the frail elderly and provide opportunities to reminisce and reflect on their blessings. About "Living With Purpose in a Worn-Out Body"
Missy Buchanan is an award-winning author, speaker, and nationally recognized older adult advocate. She is a former creativity educator and prolific writers whose articles have appeared in numerous publications including "Good Morning America's Weekly Inspirations," "Presbyterians Today," "Mature Years," "Mature Living," and more. For more information, visit www.missybuchanan.com.